This month, we look at mobile’s global dominance for internet access, the value of Snapchat’s older users for brands, and how online spend for video has overtaken banner ads. Mobile devices are forecast to account for around three-quarters (73%) of the time global consumers spend using the internet in 2018. The amount of time spent on mobile devices has doubled since 2011, when mobile accounted for 36% of all internet usage. The UK is lagging behind with mobile currently accounting for 57% of average daily internet consumption – 13% behind the global average. However, UK consumers are very heavy users of mobile e-commerce and the proportion of internet adspend going to mobile is estimated to be 63%, compared to 53% globally. Meanwhile, tablet ownership varies widely across the 52 countries, ranging from a mere 4.8% in China, where the device has hardly caught on at all, to 74% in the Netherlands. In the UK, smartphone and tablet penetration in 2018 is expected to reach 69% and 60% respectively. Only 14% of users aged 16-24 use Snapchat to find new products and brands. That figure rises to one in five (21%) among users aged 25-34. 40% of those aged 16-24 (and 43% of teenagers) admit they like using Snapchat because their parents aren’t on it. 60% of users open Snapchat at least once a day. 80% of respondents agreed that their organisation is focused on building audiences – an 18% year-on-year increase. 63% of B2B marketers said their organisation’s overall content marketing approach was ‘much more’ or ‘somewhat more’ successful than a year ago. This is due to valuing creativity and craft in content creation and production (74% of respondents) and more organizations having processes in place (37%). 87% of consumers consider mail communications to be ‘believable’, while only 48% feel the same way about email. Between 2007 and 2017, the percentage of people stating that mail makes them ‘feel valued’ has increased to 70%, compared to only 43% in 2007. 70% also responded that mail also ‘gives them a better impression of the company’, rising from 53% in 2007. A BrandScience review of multi-channel campaigns concluded that when mail was included in the marketing mix, campaigns had 12% bigger ROI than those without mail. When a commercial came on during a TV talk show, nearly half of respondents said they reached for another device. While watching the actual show, only 38% said they use another device. The figures are slightly lower for sports programmes, with 36% using another device during the show and 45% using one in the break. However, for movies, only 25% use a device while watching the film and 35% using one in the break. The study echoes previous reports about consumers’ multitasking habits while watching TV. 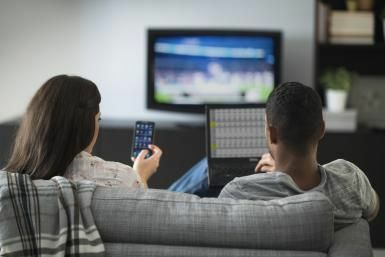 A March 2017 survey from Tremor Video and Hulu, which looked at the various activities US connected TV users perform while watching TV, found that across the age spectrum, most tend to go on social media. When it came to other activities, such as texting or gaming, younger respondents (ages 14-21) were more likely to participate than their older counterparts. 74% of consumers prefer branded email communications to any other type of communication. Gen Z are expected to increase their use of email by 83% in the next few years, making them the demographic that’s using email the most. 89% of those surveyed used email at least once in the month before the study. • 83% had used a social media tool/platform. Total digital advertising expenditure grew 13.8% to £5.56bn in the first six months of 2017. However, spending on online video ads grew three times as fast, at 46%, to reach £699m, while spending on banner ads slowed to just 2%, taking it to £685m. Video is the fastest-growing ad format and now accounts for 35% of all spend going on display advertising. Specifically, the time people spend watching short video clips has almost trebled over the last three years.